​Enrich your relationships in your home and at work. ​This is an online course facilitated by Certified Revolutionary Agreements Coach, Linda Rosenthal, which meets once per week via Zoom Conferencing. The Revolutionary Agreements is an inspiring set of techniques to facilitate true peace in personal relationships and are a proven set of effective tools for stress reduction. 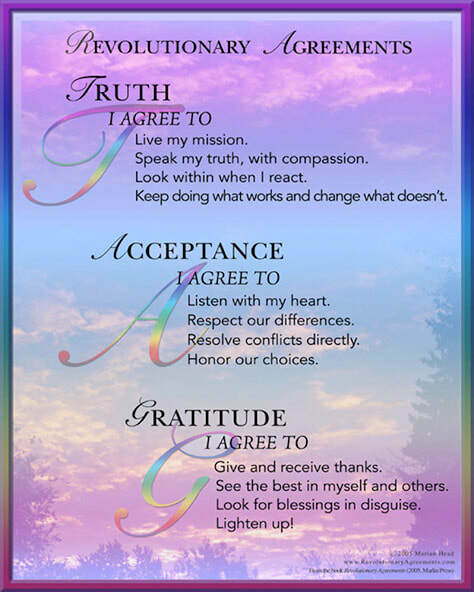 ​Listed below are the founding principles of the Agreements, arranged in the 3 pillars of Truth, Acceptance, and Gratitude. 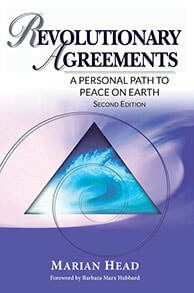 “Revolutionary Agreements is an inspiring set of techniques to facilitate true peace in personal relationships” Former US Congressman Dennis Kucinich, 2003 recipient of the Gandhi Peace Award. "Living in Peace with Yourself and Others through 12 Revolutionary Agreements" is a live, virtual online course via Zoom. Participate from the comfort of your own home! This interactive exploration into the agreements will bring congruence to your life and help you create a deeper level of personal integrity and greater success, from the boardroom to the bedroom. This course is inspired and guided by the book Revolutionary Agreements (second edition). New format! 8 weeks via Zoom. 6 students max. For further information about the Revolutionary Agreements click on the video below, featuring my coach, friend, and mentor, Marian Head, author of the book, Revolutionary Agreements​- A Personal Path to Peace on Earth.